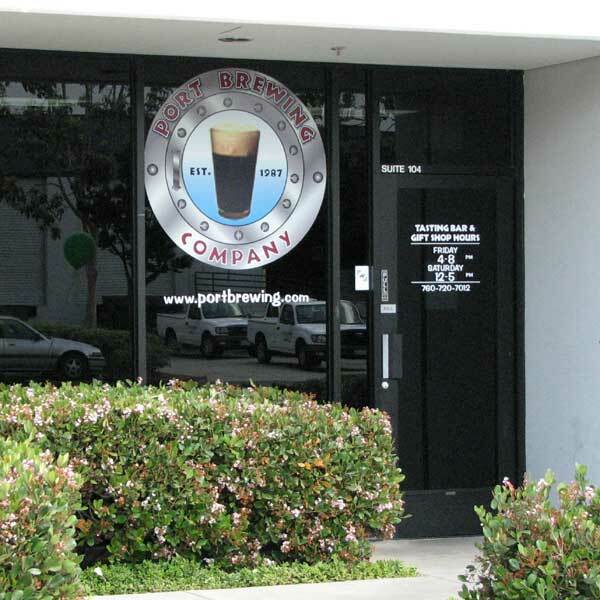 San Diego, US | Beer Blotter: Seattle based. World focused. 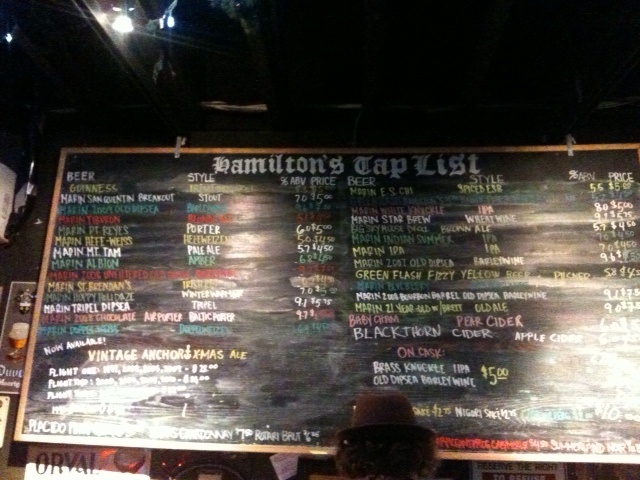 The Tap List at Hamiltons Tavern. Glorious. Type of Establishment: A place to disappear from the sunny outdoors and get lost in a beer or 5. Visit: This was stop 3 or 4 during out San Diego Beer Week trip. It was Marin Brewing Co. night with tons to offer from the Northern California brewery. There are so many, but here goes most of them. With an updated bottle list on their website, Ill let you check it out for yourself! Beers of note: Brewdog / Mikkeller Devine Rebel; Deschutes The Dissident; Firestone Walkers 13th Anniversary; Alesmith Decadence 2009 and so many more, all at reasonable prices! Usually there isn’t a menu. The day we went, we were lucky enough to encounter a full spread buffet with cupcakes to top it all off. But on your average day, come full or leave hungry. After hitting up several amazing beer locations in San Diego, we wanted to keep the vibe and our buzz going so we headed to Hamiltons Tavern. The sun was blazing outside, but as we stepped inside, I felt worlds away. Hamiltons Tavern is just that, a tavern. When I think of a tavern, I think of a dark, eclectic space with minimal access to the outside world (maybe a couple of windows in front). Hamiltons is lit in a way that creates a comforting ambiance, one that protects you from the mutation of impending drunkenness. Well not really, but it sure feels that way. 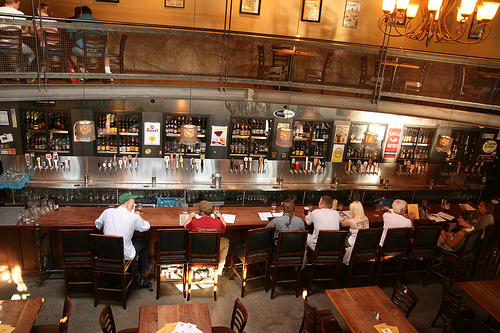 Today, Hamiltons was packed with beer lovers as Marin Brewing Co. was featured across the taps. We had the pleasure of trying Marin’s 21 year old (old ale) with Brett, Brass Knuckle IPA on cask and Old Dipsea Barleywine. We sipped on these amazing brews while chatting with the head brewer of Marin. A passionate, humble man who knows his beer and brews some pretty incredible recipes. 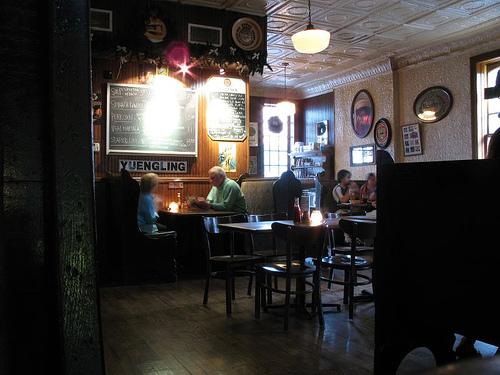 We stayed at Hamiltons for quite some time, admiring the beer while chatting up locals, brewers and bartenders. Hamiltons is spacious (although cramped today) with a long wooden bar, pool tables and high ceilings. A great place to spend a laid back Sunday afternoon or a energetic Friday night. Picture courtesy of sdbeersquad.blogspot.com. I currently do not have access to ours. Week 44 of 52– 8 MORE! Visit: A highly anticipated trip to SoCal and Alpine was at the top of our list. They have bottles to go of most beers, but they don’t always have them in stock. Today we left with a bottle of Duet, a Pure Hoppiness and Ichabod (a sour pumpkin ale). They have several options (nachos, wings) but their menu is focused on BBQ- pulled pork sandwiches, brisket, the works! After a night of bar hopping during San Diego beer week, we rolled up to Alpine Brewing Co. and I was in a bad state. The thought of getting on a plane later and worse, returning to work the next day did not help my mood. Alpine was one of the most anticipated stops on our trip so when we got out of the car and saw that the open sign did not have neon pumping through the glass tubes, I almost fainted. We peered in and saw an employee. After locking eyes, he opened the door and informed us that the hours had changed and we had an hour to kill. Phew. Coffee- stat. 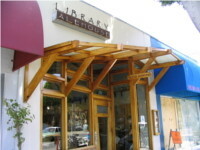 Alpine is a beautiful little town with a frontier meets artsy vibe. Exactly an hour later, we showed back up at Alpine. bb.com=Beer stalkers. The pub just opened in 2010 and has a diner quality to it with black and white checkered floor, a raised bar and shiny, plastic stool and chair covers. Almost immediately we strike up a conversation with the very nice staff members. Since they could sniff out our eagerness to experience all that is Alpine, we got a lot of attention during our stay. At this point in my day, beer is the only thing that will make me feel better. We each order our own beers to start, a Great barleywine and Chez Monieux, their kreik. Both were amazing. The Great is a big beer with a thick body and a distinct alcohol taste. The Chez was light in body, tart yet refreshing and not syrupy. Next up, an IPA tray. 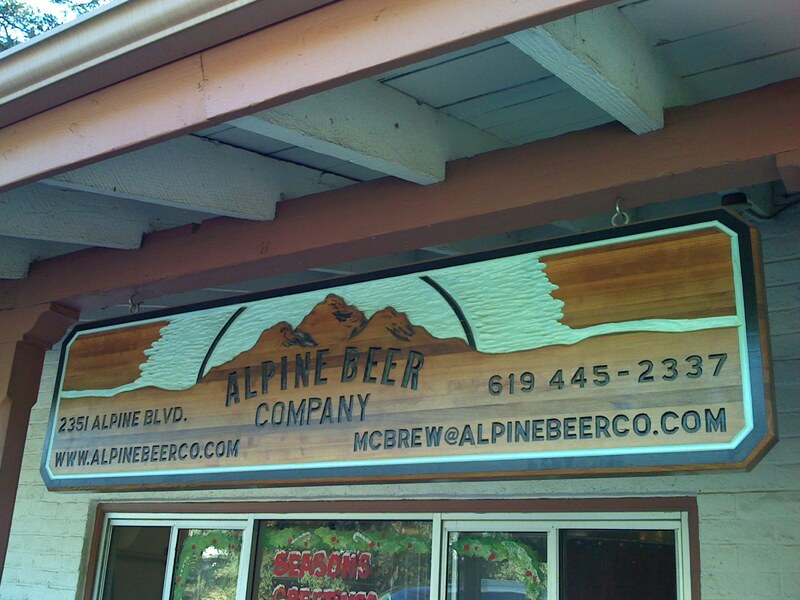 Alpine, like many Southern California breweries are known for their amazing IPAs. SoCal IPAs generally have heavier citrus notes and are light and refreshing. Our tray served in taster glasses placed in a muffin tray included: Duet, Pure Hoppiness, Bad Boy, Nelson and O’Brien’s IPA. Nelson was one of my favorite beers during our trip. Wings were ordered (of course) and they are the full wing! They have a smoky flavor to them, plenty of meat on the bones and are down right tasty. Alpine did not disappoint, in fact, it proved to me that they brew a line of quality beers- IPAs and beyond. Visiting the town, interacting with the lovely people at Alpine (very knowledgeable and they love their beer) and drinking all of their beers side by side was an experience all beer drinkers should have. To do for 2011: Purchase plane ticket to SoCal.